Wedding Signature Drinks - Spice Up Your Wedding With A Signature Drink. Wedding signature drinks have become a hot item in the world of wedding planning. They are a great way to show your personality and uniqueness, and brides and grooms everywhere are inventing drinks for their wedding. The base of wedding signature drinks is often a classic cocktail like a martini. However, options for signature drinks aren't limited. Almost any type of alcoholic (or non-alcoholic) drink can be signature drink, including mojitos, pina colodas, manhattans, margaritas and any other type of cocktail. Try to match your signature drink with your wedding theme. For a summer-themed wedding, for example, you may want to go with a mojito or a fruity drink like a mango martini. You can also match colors from your wedding with the color of your signature drink, like a blue martini for example. Experiment with different combinations of ingredients to come up with the right shade. Once you have your drink picked out you can also create a unique name for your cocktail. 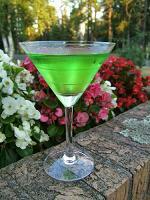 For example, instead of watermelon martini, call it a Ginatini or Lauratini. Nicknames can also be used. It is also OK to have more than one signature drink, such as a martini menu or one for the bride and one for the groom. For the reception have printed signs in frames placed on the bar announcing your signature drink so your guests are aware of it. You could also have menus printed if you are having more than one signature drink. If the bar staff is talented and daring enough, have them build a martini glass pyramid on the bar filled with your signature drink. Work with your caterer, wedding planner or wait staff to come up with ideas. Don’t be afraid to spend some time researching signature drinks. Get a few friends together at your place, break out the bottles and start mixing drinks. At the reception, have a bar set up offering different types of Vodka for tasting and mixing of drinks. For something more elaborate, consider having an ice bar or ice luge.